Elaboration: This cooperative has the latest technology for a development which enhances the qualities and virtues of this Listán White. 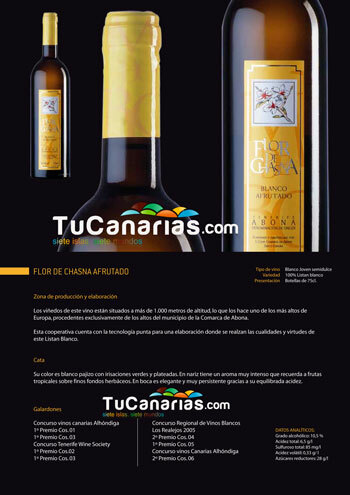 Tasting: The White Flower Chasna fruity wine is a young and fresh. Its color is white with pale green and iridescent silver. Nose has a very intense aroma reminiscent of tropical fruits such as passion fruit or peaches and also reminds us of herbs such as harsh. Flavour is elegant, cool and a perfect balance between acidity and sugar getting a wine of excellent quality. Wine consumption fast, which should consume a low temperature, 8 ° C.
Wineries Cumbres Abona: The summits Abona wines are produced in the county wine Abona, which covers the municipalities comprising between Fasnia and Adeje in the south of the island. Their vineyards reach more than 1750 meters. altitude, making them be the highest in Europe. Fundamental factors are the quality of its sun and volcanic soils that characterize the region, confinement unmatched taste and aromas, great personality. This Cooperative Society Cumbres de Abona part of the PDO of the Comarca de Abona and according to the Record Book Wineries of this denomination, there are 16 registered wineries processing and bottling. La Cooperativa de Abona Summit Winery is the largest of the Comarca de Abona and is within the top five wineries across the island of Tenerife.